First, we are tremendously grateful for this $25 million transformative gift. We are also grateful for the Collats’ continuing support for our school, and we will carry our new name with tremendous pride. This generous gift will enable us to grow in our targeted areas of strategic excellence, and it will have a transformational impact on the lives of thousands of students. For example, this gift will allow us to perpetuate student scholarships, where for the past 5 years, the UAB School of Business has had an Opportunities in Business 4-year Scholarship Program that offers 20 scholarships per year (each at $5K per year for 4 years) to recruit high achieving students representing all forms of diversity. So far, we have recruited 66 students (across the school) into this program and 14 have already successfully graduated within 4 years. We plan to use some of these endowed funds provided by the Collat gift to continue this program and to recognize these students as Collat Scholars. Second, this transformative gift has already begun to raise our school’s profile as one of the premier business schools in the Southeast, and this will benefit our beloved city and state for years to come. Our new reality as the Collat School of Business is that we are the first named school here at UAB. We are also a highly accredited and named school that will be recognized along with the other named business schools in Alabama such as the Brock School of Business at Samford, the Culverhouse College of Commerce at Alabama, and the Harbert College of Business at Auburn. Third, we are also delighted to carry the Collat name because this huge gift is a prime example of donor commitment over a long period of time. For example, The Collats have been actively engaged with our school’s programs for over 25 years where, among many contributions, they have also created the Endowed Chair of Industrial Distribution and in 2006 we named this program the Charles and Patsy Collat Industrial Distribution program. This gift also underscores the confidence that the Collats have developed in our school’s ability to continue the dedicated care and support that has helped so many students become successful. We hope that all of our students, faculty and staff will recognize the outstanding example of philanthropy that the Collats have demonstrated over so many years. In turn, we hope that our current and future students will each take this example with them as they graduate with knowledge that will certainly change their world, while they also use some of their resources to give back to causes that they care about deeply. In essence, we could not have asked for a more fitting name for our school. 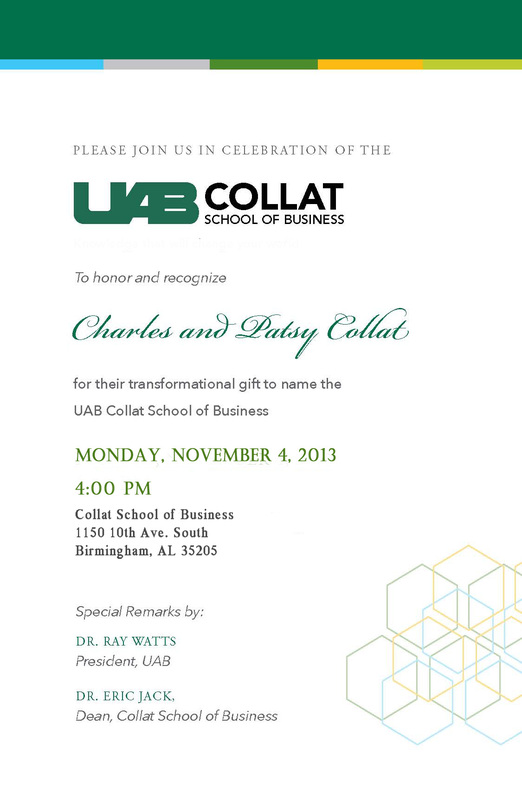 Please make plans to join us on November 4th, 4pm at the Collat School of Business for a special time to honor and recognize Charles and Patsy for their transformational gift to name the UAB Collat School of Business.